Want a relatively cheap way to spend a weekend with the family? How about trying camping? With the weather warming up, this is the perfect time to plan a fishing and camping trip! With a little planning, you can have oodles of fun without breaking the bank! First, where are you going to sleep? Do you have an RV or tent already? Okay, then are you going to stay on private land, at a campsite or what? Make sure you have any necessary permission or reservations to avoid a last minute scramble to find somewhere to park your sleeping bags! If you don’t have an RV or tent and don’t plan to acquire one, see if you know anyone who will let you borrow one or if there is an inexpensive campsite with cabins for rent (like a National Forest). Wherever you choose to stay, don’t forget to make sure you have comfortable sleeping gear, like sleeping bags or blow up mattresses. Next, what are you going to eat? Think about EVERY meal and snacks! If you are camping with small children, make sure to bring their “comfort objects”. Add them into the headcount while packing up to go home, whether it’s the teddy bear who rides with them in their car seat or the rocket ship they must have tucked in next to them to be able to rest at night or any special blankets. I love to bring these cute flashlight pals Flashlight Friends – The Huggable Loveable Child’s Flash Light and/or dream lights Pillow Pets Dream Lites – Pink Butterfly 11″ with us, because it helps make up for the absence of a regular night light with my scared-of-the-dark little ones. Both of my kids have their own, and they love them for home and especially for travel. My son has the blue camo dog in the dream lites and the dinosaur flash light pal, while my daughter has the butterfly dream lite and the unicorn flash light friend. They are AWESOME!! 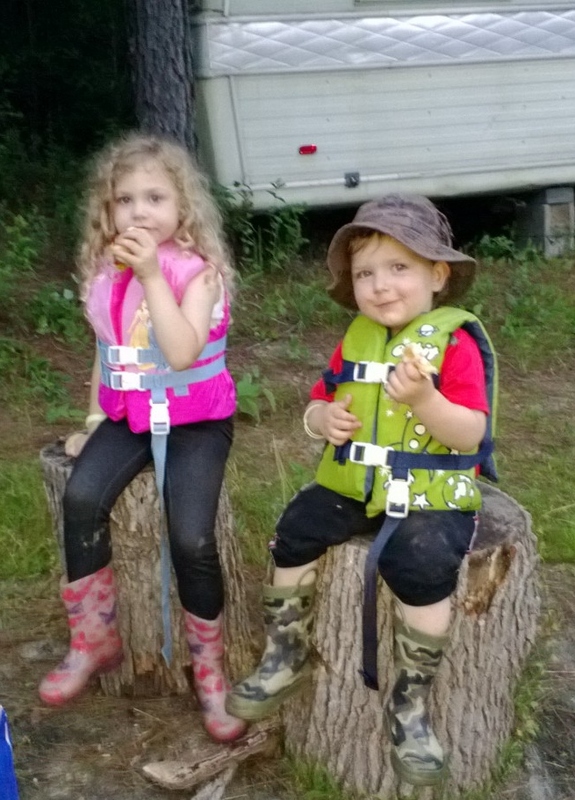 What is your best tip for camping with kids? Camping can be fun, just make sure you are well prepared with everything possible that your little ones may need or be accustomed to. It will make a huge difference in the outcome of your trip if you go prepared instead of flying by the seat of your pants. Need tips for traveling with little ones? Head on over to Traveling With Little Riders! Looking for gift ideas for your outdoorsman? You need THIS LIST!!! Categories: Frugal Family, Living Life | Tags: bonfire, budget vacation, camping, camping with kids, cheap travel, children, family, fishing, outdoors, safe camping, summer, traveling with kids, vacation | Permalink. We love camping as a family! Although most people would probably call it glamping, my parents have a resort, full hookups (even cable!). We have a large RV with all the kids (5) jammed in bunks at the back end. It’s messy, we get very little sleep, but it is fun! Thanks for sharing and linking up at Favorite things Friday! Hope to see you again this week! We love camping with our kids! Preparing in advance is definitely the way to go. I try to get as much of the food prepped before the trip so I don’t have to cook much while we are there.